For many of us pet parents, our cats and dogs are truly part of the family—their pictures make up the majority of our Instagram feeds, they make appearances in most family photos or holiday cards, and they cuddle up on the couch during family movie nights. Accordingly, it's not too uncommon for our pets to absolutely sabotage the holidays—just like many human family members are apt to do. The major differences? Our kitties and puppies probably aren't starting arguments over politics and they're much, much cuter, so it's easier to forgive them. 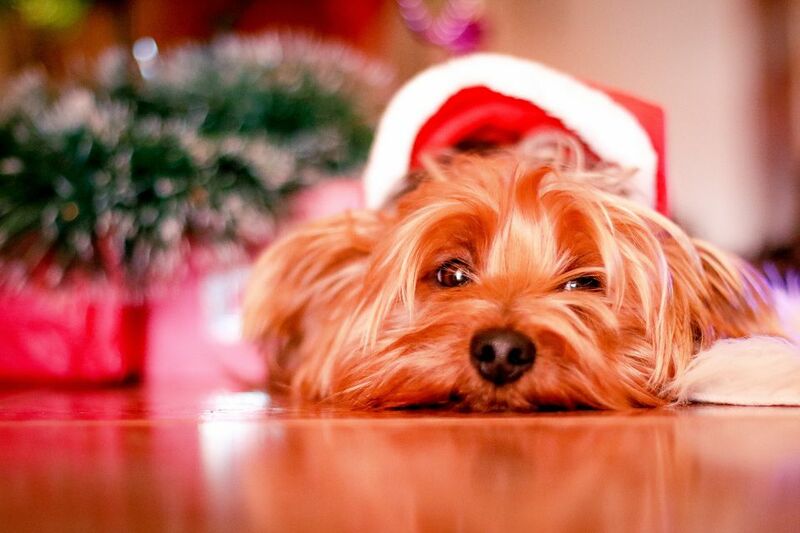 Whether you're hosting Christmas this year and you need to laugh, so you don't cry, or you need confirmation that you're not the only one whose cat has toppled the christmas tree, read on to see 12 cats and dogs that totally ruined Christmas. There's no denying it: Untangling yards and yards of Christmas lights is not an easy task. But what makes it even more difficult is when your cute little doggy watches you spend hours untangling them, only to re-tangle the lights mere moments later. Our advice? Just get some new lights and save your sanity. Bringing a puppy into the family is so amazing. Not only are they ridiculously cute, but they're so curious about the world around them—and during the holidays, unfortunately, that may mean they're very curious about your cherished Christmas ornaments. If you're adopting a Christmas puppy this year, hang those ornaments high. Decorating a Christmas tree is quite the undertaking: The lights have to be perfectly spaced around the tree, ornaments can't be too close to each other (but they can't be too far, either! ), and once the decorations are in place, absolutely no one can touch them until the tree is being taken down. Except, of course, for your Christmas cat who loves to ruin your hard work. After so many hours of painstakingly hanging lights and ornaments on the Christmas tree, it'd be such a shame for someone to topple the Christmas tree, says your sweet and innocent kitten. Some dogs eat spoiled, old food out of the garbage. Some dogs eat other animals' poop. And some dogs eat all of the Christmas cookies you spent hours and hours baking for your kids' holiday cookie fundraiser. Between finding all the decorations in the attic, sorting through the boxes, and putting your holiday decor out on display, you can spend a solid day or two decorating the house for Christmas. But does your cat care? Absolutely not—she'll plop right down in the center of your nativity scene with zero regrets. Toddlers and cats are surprisingly alike. Here's how: They both need someone else to clean up their poop, they both have random, wild bursts of energy, and they both make it crystal clear that they hate posing with Santa for holiday photos. Like we said before—dogs are apt to eat pretty much anything, and the snacks you leave for Santa are no different. Here's a pro tip if your doggo keeps stealing Santa's cookies: Put them on a higher table or counter. Or, alternately, leave plain celery stalks for the Man in Red—although you probably won't wake up to the world's greatest gifts. It's no secret: Drinking festively flavored alcohol is a major part of the holiday season. That being said, it's never fun when someone drinks a little too much eggnog and gets cranky—especially if that someone is your already-curmudgeonly cat and the eggnog just makes him even more mean. Cutting wrapping paper in a straight line is tough. Folding neat corners is tough. Choosing the perfect bow to coordinate with your handmade wrapping paper is basically impossible. But you know what makes it even harder? When your goofy dog gets into the wrapping paper bin and starts donning your gift wrapping accessories. What's even more difficult than wrapping a whole bunch of holiday gifts? Watching someone tear through your thoughtfully wrapped gift like you didn't spend two solid hours making sure the corners were sharp enough. Your cat probably didn't even notice the hand-curled ribbons. Receiving a bad gift—and pretending to be gracious—is really part of the magic that makes up the holiday season. But your dog? She doesn't care who knows that she hates her gift.